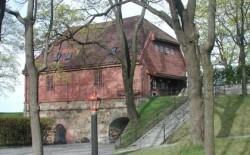 Norway's Resistance Museum is housed in an old protected building in Akershus Castle Oslo, adjoining the memorial at the spot where Norwegian patriots were executed by the Germans during the second world war. Norway's Resistance Museum was established in 1966 as an independent foundation for the purpose of �Contributing to the presentation of a true and authentic picture of the occupation by means of objects, pictures, printed matter, etc., collected preserved and exhibited with a view to giving the young people of today and coming generations a true to life impression of the evil represented by occupation and foreign rule, in this way helping to strengthen the sense of unity and defence of our national liberties�. The Museum was opened to the public in May 1970 by HRH Crown Prince Harald celebrating the 25th anniversary of liberation. The initiative to the Museum and in fact the creators of the institution were a group of persons who had been actively engaged in the resistance. Overall architectural planning was entrusted to Otto Torgersen who with key personnel from various branches of the underground forces produced a chronological gallery through the period from the prelude in the 1930's onwards to liberation in 1945.